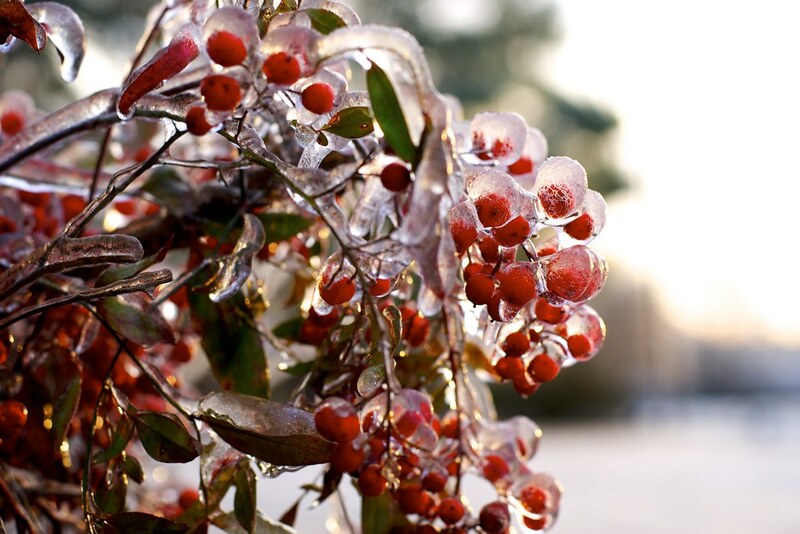 I don’t know if these are actual berries or not, or just some red seeds that happen to look like their fruit-based counterparts, but I liked how they were covered in ice after a recent day of freezing rain. The sun was just peeking over the horizon out of frame, which added a nice glow to the frozen bulbs. When I went out to take this photo I promised my wife I would only be gone for a few minutes, because I didn’t want to leave her stranded with two kids to dress and feed while I was out tromping around in the snow with my camera. Because of that time limitation I had to find some subjects to photograph in relatively short order, and thus I ran over to our neighbor’s house where I found these red berries/seeds/whatever encased in ice like Han Solo in carbonite. I tried several angles to get the shot I wanted, but to be honest I wasn’t entirely sure just what shot I was even going for in the first place. After a little while I realized that rather than shooting into the bushes I could point my camera outwards and use the morning sunrise for a bit of backlighting. I shot this at f/4 which, in retrospect, might have been a bit too wide. There’s a time for everything under the sun, and not every photograph calls for ultra-shallow depth of field. A smaller aperture would have mitigated the issue with the big blurry branch jutting vertically through the middle section of the photo, but then, I do like how the viewer’s eye is brought to the red seeds on the right-hand side instead. But photography is all about experimentation, and if nothing else this gives me a few things to try the next time we get a freezing rain.